Reading and share top 31 famous quotes and sayings about Dreading by famous authors and people. Browse top 31 famous quotes and sayings about Dreading by most favorite authors. 1. "My eyes darted to her, dreading to see the pain I knew I would find. Please, Melanie, you have to know I only wanted this with you. I couldn't say the words out loud, but I prayed she would understand, that she could see it in my eyes." 2. "[H]e lay awake, dreading the dawn when he would have to say good-bye to the small universe he had built for himself over the years." 3. "I knew he would soon strike, and while dreading the blow, I mused on the disgusting and ugly appearance of him who would presently deal it." 4. "At night I no longer dreamed, nor did I let my imagination work during the day. The once vibrant escapes of watching myself fly through the clouds in bright blue costumes, were now a thing of the past. When I fell asleep, my soul became consumed in a black void. I no longer awoke in the mornings refreshed; I was tired and told myself that I had one day less to live in this world. I shuffled through my chores, dreading every moment of every day. With no dreams, I found that words like hope and faith were only letters, randomly put together into something meaningless - words only for fairy tales." 5. 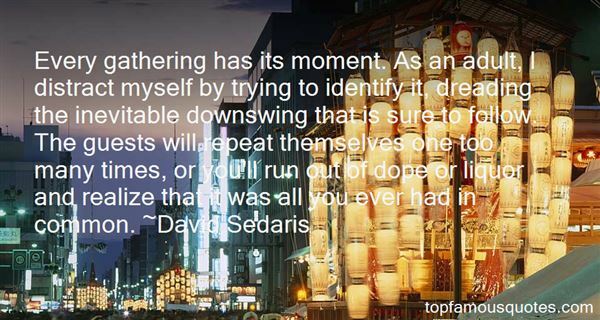 "Every gathering has its moment. As an adult, I distract myself by trying to identify it, dreading the inevitable downswing that is sure to follow. The guests will repeat themselves one too many times, or you'll run out of dope or liquor and realize that it was all you ever had in common." 6. "Most people go through life dreading they'll have a traumatic experience. Freaks were born with their trauma. They've already passed their test in life. They're aristocrats." 7. "So I am content to tell my simple story, without trying to make things seem better than they were; dreading nothing, indeed, but falsity, which, in spite of one's best efforts, there is reason to dread." 8. "Let even an affectionate Goliath get himself tied to a small tender thing, dreading to hurt it by pulling, and dreading still more to snap the cord, and which of the two, pray, will be master?" 9. "The mind, it occurs to me, is an engine. There is an ambient mode in which the mind sits idling, before there is information. Some minds idle in a kind of dreading crouch, waiting to be offended. Others stand up straight, eyes slightly wide, expecting to be pleasantly surprised. Some minds, imaging the great What Is Out There, imagine it intends doom for them; others imagine there is something out there that may be suffering and in need of their help.Which is right? Neither.Both.Maybe all of our politics is simply neurology writ large. Maybe there are a finite number of idling modes. Maybe there are just two broad modes, and out of this fact comes our current division." 10. "Dreading dusk, fearing night, praying for dawn." 11. "I heard a rapid alternation of notes,a vibrating staccato of an ancient instrument,nearly as old as nature herself, a cricket singingin my garden last night, the first time this year. When turning my garden's soil,I often uncover crickets, curmudgeons that scramble to find solitudeand cover from the light,but I rarely hear theirancient song 'till near summer's end. Although the wind is now lofting the branchesand rustling the leaves,the evening sun still warms my face. And my garden still blooms fullwith pink-papered hollyhocksand blue, green spikes of lavender,and roses, bright pinks and yellows, all glowing from sunshine-swelled canes, and zinnias, rainbow-shingled orbs,and more. And yet, I am already dreading the coming of fall, all dressed in small rags of red, yellow, and orange. I know that my summer garden is nearing its end,as hailed by the cricket's song." 12. "Any assemblage comprising human beings, any family, any party, any tribe, any nation, will bind itself together not by what it shares but ultimately by what it fears, which is often so much greater. Perhaps it abhors the outsider as camouflage for its own alarms; dreading what it would do to itself were the binding to fall asunder." 13. "Why is everyone complaining?" Daisy asked impatiently. "Thisis exciting! We get to perform. Do you know how long I have beenwaiting for this day? ""Unfortunately, yes," Sarah said flatly. "About as long as I have been dreading it," Iris muttered." 14. 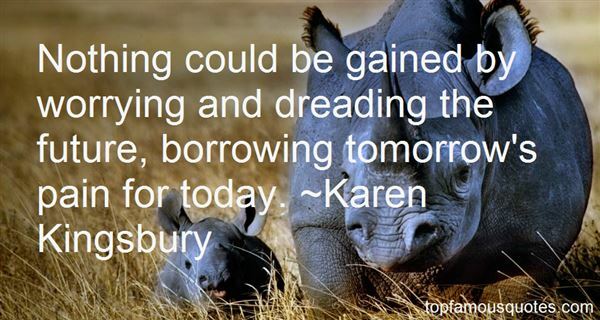 "Nothing could be gained by worrying and dreading the future, borrowing tomorrow's pain for today." 15. "I wish I could explain it so someone could understand it. I'm afraid it's something I can't put into words. There's just this heavy, overwhelming despair - dreading everything. Dreading life. Empty inside, to the point of numbness. It's like there's something already dead inside. My whole being has been pulling back into that void for months. (81)"
16. "She leaned in and hugged me. "I know. Thanks. I love you, too. And for the record, Cheyenne and Landon are soul mates and if they don't end up together, I want you to find a poltergeist to haunt the Easton Heights writers. "She pulled back, smiling at me, then reaching out to ruffle Lend's hair. "Take care of each other, you two obnoxious kids. "Then, throwing her shoulders back and staring straight forward, she walked through the gate. I watched, dreading seeing her turn into dust or something, but gasped in relief and joy as her ruined, unnaturally preserved body blossomed into something new, something strong and proud and undeniably alive.She turned back, just once, and although she was nearly unrecognizable, I could see our Arianna in her smile that managed to maintain its trademark ironic twist. "I'm going to miss her," I said."What?" Lend shouted. "I said, I'm going to miss her! ""I can't hear you! I'm going to miss her!" 17. "I opine-I think you're a woman of your world,' he said from the far end of the couch. 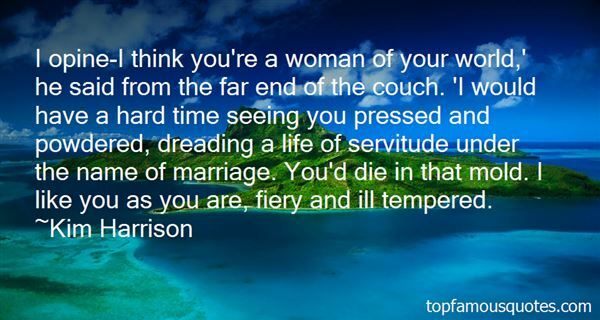 'I would have a hard time seeing you pressed and powdered, dreading a life of servitude under the name of marriage. You'd die in that mold. I like you as you are, fiery and ill tempered." 18. "I was dreading all of the ghost stories of working on American television, not in the least, the length. In Britain, a series is six episodes of an hour drama, maybe sometimes eight, but never twenty-two, so I was petrified of that." 19. "Have you ever known there was something you needed to do, but found yourself dreading it with everything you were?" "Once or twice," he said. "What did you do? "Runach looked at her steadily. "I did what needed to be done. ""Was the price steep?""Very. "Aisling clutched her own bow, wishing her task was nothing more than learning to place an arrow where she wanted it to land. "Did you ever want to run?" She whispered.He smiled, but it was a pained smile. "I'm not sure I want to answer that." "Do you think Heroes ever want to run...? ""Only if they come from Neroche. "She blinked, then smiled." 20. "Some people awake each morning dreading the day looking for the negatives in their lives and in others, while some awaken fresh appreciating the opportunity to contribute to life, making the world a better place and see the positives. Neither is right or wrong for we are human, we all make a conscience choice everyday as to who we shall be." 21. "Goodreads.com is actually about fiction not dreading goo. But I have a profile there, anyway..." [tweeted 3/19/2013 from @MikeArnzen]"
22. "Why was it that when you were looking forward to a specific day, it took forever to arrive, but when you were dreading a day, it was there immediately?" 23. "Raquel Welch is someone I can also live without. We've got some love scenes together and I am dreading them!" 24. "FEARS AND doubts repel prosperity. Abundance cannot get to a person who holds such a mental attitude. Things that are unlike in the mental realm repel one another. Trying to become prosperous while always talking poverty, thinking poverty, dreading it, predicting that you will always be poor, is like trying to cure disease by always thinking about it, picturing it, visualizing it, believing that you are always going to be sick, that you never can be cured. Nothing can attract prosperity but that which has an affinity for it, the prosperous thought, the prosperous conviction, the prosperity faith, the prosperity ambition." 25. "It's not helpful if we spend every day dreading tomorrow ~Jai"
26. "Closing your eyes won't make the awfulness go away. It may be that nothing will. But dwelling on it, dreading the evil, playing out the misery in your head - doesn't this feed the monster? You can't close your eyes to life, but you can choose where your gaze lingers." 27. "I don't like coming home. It keeps me from being nostalgic, which by nature I am. Even before the plane begins its descent, I find myself dreading the questions left unanswered by my childhood." 28. "One more time? For the audience?" he says. His voice isn't angry. It's hollow, which is worse. Already the boy with the bread is slipping away from me.I take his hand, holding on tightly, preparing for the cameras, and dreading the moment when I will finally have to let go." 29. "He was numb except for dreading the loss of numbness." 30. "Nor dread nor hope attendA dying animal;A man awaits his endDreading and hoping all." 31. "A man awaits his endDreading and hoping all;Many times he died,Many times rose again"
I have a son in Barcelona whom I am madly in love with."